Product code: Q836 Categories: Sold Items, Sold Pocket watches. Here is one of the most magnificent examples of an antique enamelled pocket watch that we have seen for quite some time and one that is simply breathtaking. 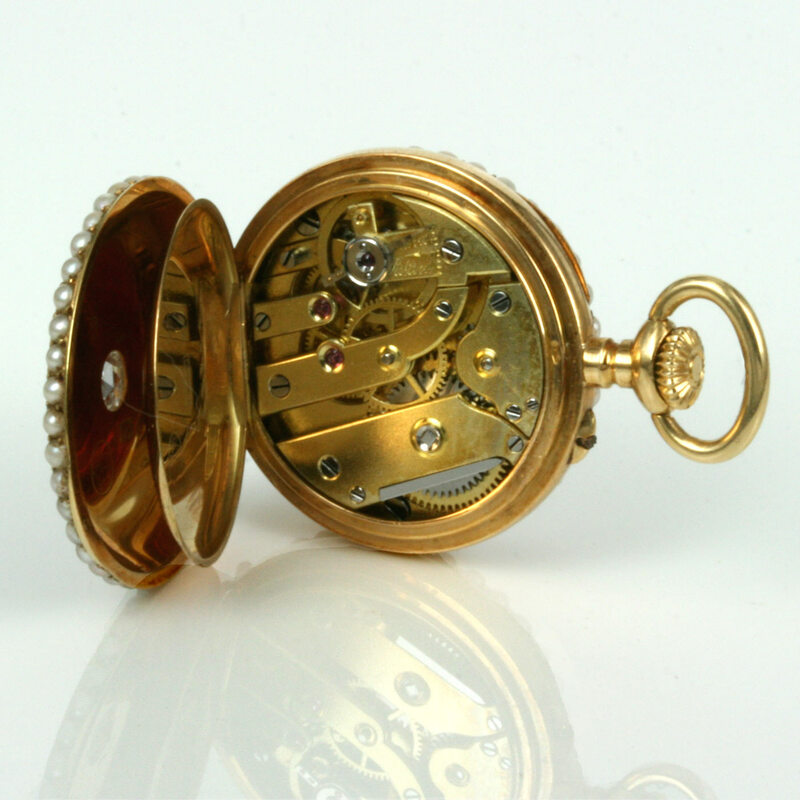 This elegant ladies pocket watch was made in the 1890’s in 18ct yellow gold and measures 24mm across by 35mm from the bottom to the top of the bow. However it is the use of pearls, enamel and the lovely rose cut diamond that really sets this pocket watch apart from so many others. On the side with the enamel and diamond there is a border of 39 seed pearls and on the other 35 more seed pearls. The red enamel on the reverse side is magnificent and is a technique called guilloché enamel where under the enamel is engraved which really stands out after the enamel is applied. Thankfully there is no damage at all to the enamel and has such a wonderful vibrant red colour to it. In the centre is a magnificent 0.20 carat rose cut diamond to add to the elegance of an already amazing antique pocket watch. The dial is all original and as clean and easy to read today as wit was when this was made well over 100 years ago and had very elegant numerals and hands to match. The movement is wound via the crown and the time set by pushing in the pin just above the 11 o’clock position and turning the crown to set the hands. In perfect condition, this pocket watch runs superb and comes with our 12 month warranty. No matter which side of this pocket watch is viewed you will be captivated by its charm and character and this will always be admired by all who see it.